All 110 seats in the Michigan House of Representatives will be up for election in November. Republicans currently hold a 59-51 majority, following a 63-47 majority after 2010. There are 40 open seats, 21 held by Republicans and 19 held by democrats. There are 30 open due to term-limits and 10 just seeking another office. Republicans gained one new seat (73) and one existing seat (39) due to redistricting, but also lost one existing seat (55) in 2012. They also lost five incumbents (52, 71, 84, 91, 110), not counting party-switcher Roy Schmidt (76). 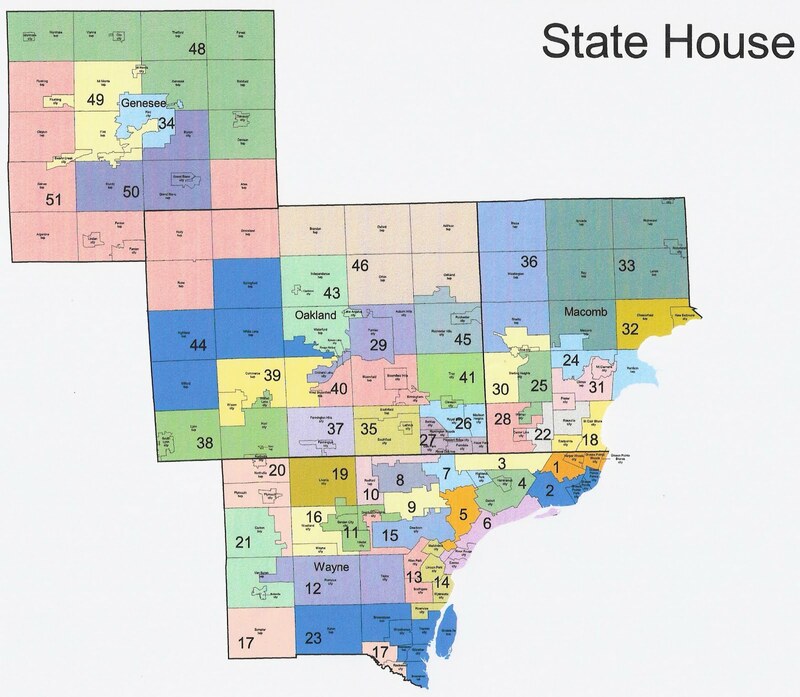 They could have won several more seats with a more effective redistricting plan. Democrats want to take back the state house, but face a difficult playing field. Of the Republican-held open seats, only 56 and possibly 65 are competitive. They will try to defeat some Republican incumbents, but it is not clear how they will beat incumbents this year that they couldn’t defeat in 2012. Meanwhile, Republicans will seek to gain seats. The best opportunity is the open 84, which was lost due to scandal in 2012. There are two lean dem open seats (21, 62) that may be competitive. Republicans will also try to defeat several incumbents who picked up seats in 2012 (25, 71, 91). There are a number of interesting primaries in August. A bunch of Republican incumbents are being challenged due to their support of Medicaid expansion, Common Core, and the Detroit Bailout. Most will win easily, but there is the potential for a few to be surprised (39, 79, 107). The open seats feature more competitive primaries, many of which also feature establishment versus Tea Party battles. Establishment candidates are receiving support from the Chamber of Commerce and Great Lakes Education Project. More conservative candidates are receiving support from Americans for Prosperity and Madison Project Michigan. State house fundraising is analyzed in the following article. The following lists district number, current incumbent, geographic description, 2012 state house result, 2012 Romney %, and political rating. I did not use ‘likely’ in the ratings. Candidates are labeled as establishment (E), Tea Party (T), and solidly conservative (C), when these labels clearly apply. Brian Banks won the 2012 democrat primary before his long criminal record and repeated failure to pay rent (he was kicked out of his campaign office) was exposed. He has six primary challengers, but his main competitor is Rebecca Thompson, who significantly outraised him. (Likely Cox) Laura Cox (E), a Wayne County Commissioner and wife of former Attorney General Mike Cox, is favored over Ken Crider to win this safe R seat. Carol Fausonne has a chance to pick up this open seat, but it could have been drawn much better if it included all of Canton. Three dems are competing in the primary. In 2012, Pat Summerville (C) was narrowly reelected in the most dem seat held by a Republican. He is probably a modest favorite this time. Two dems are competing to face him. Nick Hawatmeh will try to beat dem Henry Yanez, who won a new open seat in 2012 which could have been much better drawn. Dem Joseph Bogdan is seeking a rematch with Jeff Farrington, who beat him in 2012, but he has a primary with Bo Karpinsky first. (Lean Grot) There is a bitter, expensive primary for this seat between Stan Grot (C), Shelby Township Clerk, and Macomb GOP official, and lawyer Peter Lucido, who has rarely voted in the past. (Likely Crawford) Hugh Crawford’s wife Kathy Crawford (E), who is also an Oakland County Commissioner, faces retired pastor Dan Lauffer (T). (Lean Kesto) Klint Kesto (E), the surprise primary winner in 2012, faces a serious primary challenge by Tea Party leader Deb O’Hagan (T). 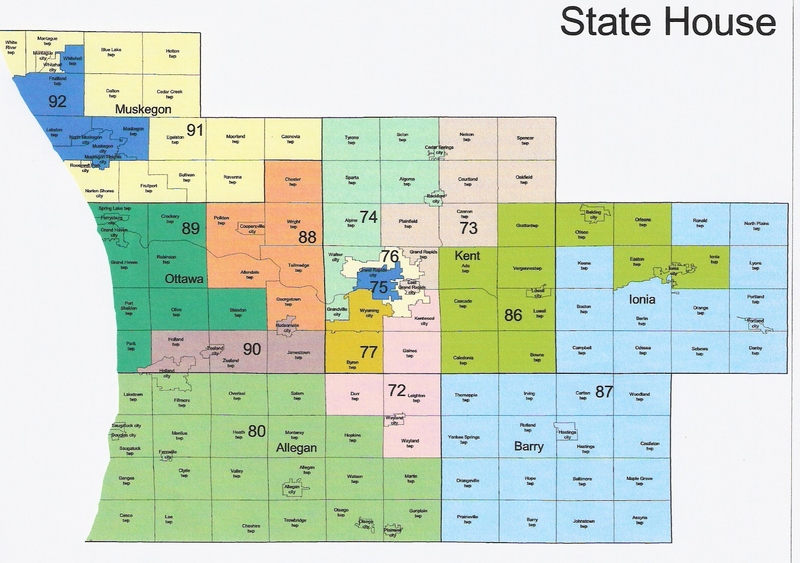 Two dems are seeking to beat Kesto, who picked up this seat in 2012. Martin Howrylak (C) faces a rematch with Mary Kerwin, who he barely beat by 1% in 2012. (Likely Theis) Former Livingston GOP chairwoman Lana Theis (C), who is endorsed by Right to Life, appears to be the favorite in the GOP primary against three others, including fake Republican Rich Perlberg. (Tossup) Five Republicans are competing for the nomination, including Independence Township Trustee Jose Aliaga (C). Oakland County Commissioner Jim Runestad (C) seems to be the favorite of both the Tea Party and establishment over moderate Liz Fessler Smith and two others. (Lean Webber) Michael Webber seems to be the favorite over Mark Avery here. (Likely Jacobsen) Bradford Jacobsen is being challenged by John Reilly (C). (Tossup) This seems to be a three-way race between former school board member Wendy Day (T), Howell Mayor Phil Campbell (C), and township supervisor Henry Vaupel, who seems to be somewhat more moderate. Gretchen Driskell beat Mark Ouimet by 6% in 2012. John Hochstetler is on the ballot, but not running a serious campaign. Republicans Irma Kubiske and Jason Sheppard (C) will compete to face dem Tom Redmond for the seat of Dale Zorn, who is running for state senate. This is the most competitive open Republican seat. Nancy Jenkins, who was reelected by 5% in 2012, will face dem Sharon Wimple. (Tossup) There are seven candidates in this wide-open race, including county commissioner Brad Benzing and businessman Jeff Jacques. (Lean Bippus) Road commissioner John Bippus (C), who is endorsed by Michigan Right to Life, is favored over superintendant Roger Rathburn, teacher Aaron Miller, and GOP activist Bob Sills. (Lean Buskirk) Three dems, Kalamazoo County Commissioner David Buskirk, an old-school union dem, gay progressive campaign strategist Jon Hoadley, and black Kalamazoo Township Trustee Patricia Goodacre, will compete for this safe dem seat. (Tossup) Kalamazoo County commissioners Phil Stinchcomb (C) and Brandt Iden (E) are competing for this seat. (Tossup) County commissioner Art Kale and doctor John Bizon, who has strong fundraising, are competing for the GOP nomination. (Lean Todd) County commissioner Terris Todd is probably the favorite for the dem nomination over two other candidates, though all three have weak fundraising. (Lean Potter) Republican Marshall school board president Vic Potter, who is endorsed by Right to Life, and moderate Kalamazoo County Commissioner David Maturen (E) will compete for the seat of Speaker Jase Bolger. Dem Bill Farmer, who almost upset Bolger in 2012 due to the Roy Schmidt controversy, will run again. (Tossup) Six Republicans, including Robert Sutherby, who is endorsed by Michigan Right to Life and Rep. Shirkey, will compete here. Dem Theresa Abed upset Deb Schaunessy by 7% in 2012. She will face Iraq war veteran Tom Barrett (C) in this hotly contested seat. (Likely Yonker) Rep. Yonker (E) is being challenged by retired veteran Gabe Hudson (T). (Lean Afendoulis) Grand Rapids Township Treasurer Chris Afendoulis seems to be the favorite over salesman Frank Pfaff (C) and five other candidates. (Tossup) Keith Allard (C), former campaign manager for Justin Amash, is competing with Donijo DeJonge (E) to face dem Winnie Brinks, who beat scandal-tainted dem-turned-R Roy Schmidt in 2012. (Likely Pagel) Rep. Pagel (E) is being challenged by Jim Walker (T). (Lean Pscholka) Moderate state rep. Al Pscholka (E) will face nurse Cindy Duran (T) in this hotly contested primary. (Lean Gamrat) Tea Party leader Cindy Gamrat (T) will face Mary Whiteford (E) and two others in the primary for this conservative district. (Tossup) Todd Courser (T), who almost was elected MIGOP chairman in 2013, faces Jan Peabody (E) and two other Republican candidates. (Tossup) This is the best chance for Republicans to pick up a seat, and where the primary will make the most difference. In 2012, dem former state rep Terry Brown (2006-2010, 2012-2014) won back his old seat. He defeated Huron County drain commissioner Dan Grimshaw, who defeated ethically challenged incumbent Republican Kurt Damrow in the primary. Brown is term-limited and running for state senate. Damrow and Grimshaw are among seven Republicans seeking this seat, which is the most Republican seat held by a dem. (Likely Lyons) Rep. Lyons (E) faces Angela Rigas (T). (Likely Price) Rep. Price (E) faces Matt Wiedenhoeft (T). (Lean Garcia) Former Pete Hoekstra staffer Daniela Garcia (E) has Rep. Joe Haveman’s support against Geoff Haveman (T), a distant relation, and two others. (Safe Hughes) Former state rep. Holly Hughes, who was defeated by 0.8% by dem Colleen LaMonte in 2012, will seek a rematch. She is safe against two minor candidates in the primary. Pro-life dem Norman Braddock, a Saginaw city commissioner, will compete with progressive Vanessa Guerra. (Lean Glenn) Gary Glenn (T), a conservative activist supporting Right to Work and traditional marriage, faces Karl Ieuter (E) in this expensive and hotly contested primary. Ray Franz (C), who was reelected by 2% in 2012, will seek a final term against dem Tom Stobie, who outraised him so far. (Tossup) There are eight Republicans running in this wide-open primary. (Lean Cole) Triston Cole, a farmer who was the runner-up four years ago, is the favorite over Tony Cutler. Peter Pettalia, who was reelected by 7% in 2012, will seek a final term. Three dems are competing to face him. (Tossup) Rep. Foster (E) faces a tough primary against Lee Chatfield (T), who has very strong fundraising, due to Foster’s support of Medicaid expansion, Common Core, and gay rights. This is probably the best chance for conservatives to defeat an incumbent Republican. Scott Dianda, a fairly conservative dem who beat Matt Huuki by 3% in 2012, is safe against Bob Michaels. They also lost five incumbents (52, 71, 84, 91, 110), not counting Bobby "I ♥ Jennifer Granholm" Schostak and Jase "all in the family" Bolger electioneering a last minute party switch with Roy Schmidt (76). They could have won several more seats with a Conservative in the governors office, however, as everyone can see there is no amount of gerrymandering possible that can save RINO leadership. There! Fixed those *little omissions* for y'all.